Info "Oh, no! My stuff got buried in the sand! Use the sieve to find all of it for me!" Sifty Character is a microgame in WarioWare: Smooth Moves in 9-Volt and 18-Volt's stage. It uses the overworld theme of Super Mario Bros. 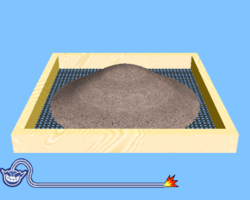 The object is to shake the Wii Remote to sift all the sand out to reveal an item. Level 1: A small amount of sand, which reveals a deck of Nintendo playing cards. Level 2: A medium amount of sand, which reveals a Game Boy. Level 3: A large amount of sand, which reveals a Virtual Boy. This page was last edited on March 20, 2018, at 20:21.